Dada (1916-1924) and Surrealism (1924-1966) stand as two movements from markedly different time periods and cultural contexts. Both of these span artistic, literary and intellectual activity of the early 20th century, involving circles of writers, poets and visual artists who feed into a larger group output. Dada launched in 1916 in Zurich as a direct reaction to World World I and the group’s practices were marked by a defiance and anger which linked both the artists involved and their oppositional, antagonistic attitudes to war. Deliberately anti-authoritarian, a nihilistic spirit drove Dada and it worked itself independently into loosely affiliated centres including New York, Berlin and Paris. Tristan Tzara writes the ‘Dada Manifesto’ in 1918, outlining its revolutionary impetus and intentions; in particular, that a world ‘un-made’ by war served no purpose, rejecting modern society’s previous unchecked ‘rationalism’ and ‘progress’. In comparison, Surrealism was officially inaugurated in 1924 as a small, self-contained group in Paris. The Surrealist’s longevity comes partly down to leader André Breton (1896-1966) who, on publishing his ‘Manifesto of Surrealism’, sought aims and collective group contributions towards a greater understanding of the unconscious and unexpected modes of creation. Without the impetus of war, Surrealism concerns itself with its own alternative logic, bound up with the psychoanalytical theories of Sigmund Freud and building a new sense of meaning which Dada had denied. In each movement’s logic to drive forward ‘autonomous’ development, the impetus behind Dada and Surrealism was the critical concept of ‘chance’ as a creative strategy to generate art. With Dada, chance would be used to signify arbitrary processes, functioning within the movement’s capacity to work without motives and deploy anarchistic anti-art. Dadaist Hans Arp (1886-1966) interplayed chance with composition in a bid to tap into the random and accidental forces which stood against rational order and its connotations of mechanisation, organisation and nationalism. Surrealism worked from the release of individual ‘automatic’ processes which was linked by the group to spontaneity, approaching chance from another position paralleled with dreams and the freeing of subconscious forms. Fig 1. Hans Arp, Squares Arranged According to the Laws of Chance, 1916 – 1917, torn and pasted coloured paper on coloured paper, 48.5 x 34.6 cm, MoMA. This movement opted to use free play and games such as automatic writing or the exquisite corpse to toy with Breton’s definition of ‘pure psychic automatism’, an induced state which would run across the body of work produced. Here, Joan Miró (1893-1983) would respond to Breton’s requisite with an experimental pictorial sign language in painting and directly engage with the unconscious through this technique. Hans Arp’s collage format as seen in ‘Squares Arranged According to the Laws of Chance’, 1916-1917 (fig. 1) embraces ‘the law of chance’ as a tool to ‘surrender’ the ‘unconscious’ and mimic those randomly occurring structures of nature which were seen as an antidote to rationality. 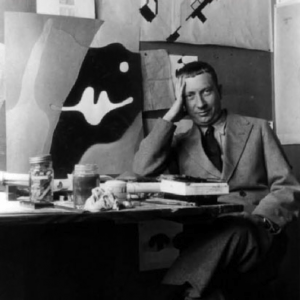 Jean or Hans Arp in Studio. Dada consciously looked to subvert the forces which their skepticism was directed towards and, within this mindset where war stood as the source of atrocity, rationality became a negative association to be targeted and destroyed. Arp achieves this by removing man’s intervention through random selection, incorporating chance within artistic production as described in Hans Richter’s account on “chance collages”. Richter writes how Arp ‘tore paper’ and used ‘chance movements’ to form the ‘pattern’ which was the result of the accidental as determined by chance. On one level, this surrenders artistic control and creation over to arbitrary and uncontrollable elements, revealing the Dada’s aim to overtly critique traditional notions of technique and excellence. On another, such radicalism and departure is at the same time used to comment on as Robert L. Herbert writes ‘the way in which impersonal machines’ had been ‘killing young people at random’ in the war, reacting with an ‘impersonal’ method. Joan Miró, ‘Maternity’, 1924, oil on canvas, 92.10 x 73.10 cm. 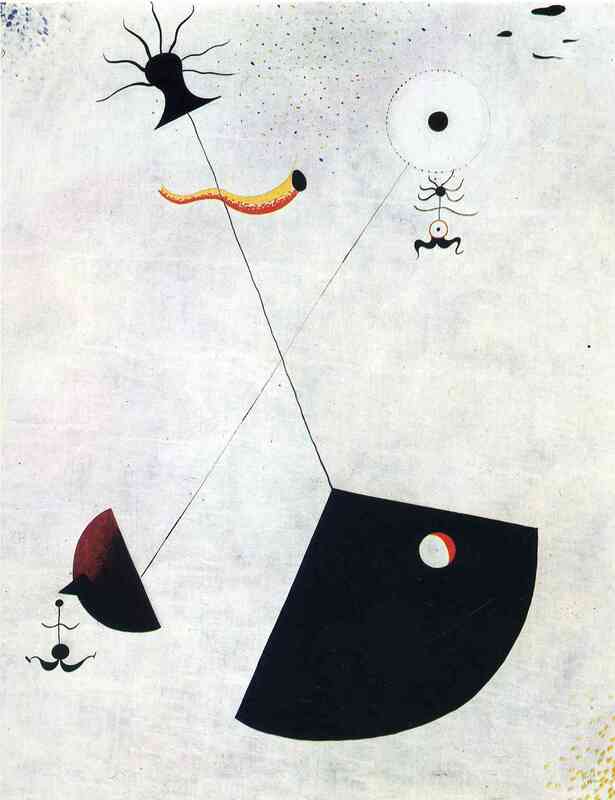 In contrast, Joan Miró’s interaction with chance is conducive with the abstract, biomorphic forms of his paintings, as in ‘Maternity’, 1924 (fig. 2). Miró develops this mode over 1922-1924 and operates in a spontaneous and ‘automatic’ manner to trigger a visual language directly mapped out from the mind’s configurations. The resultant body of work shifts the Surrealist oneiric formula into the abstract, where, relations are formed through dominantly biological signs and symbols , used in ‘Maternity’ to represent fundamental life-processes in a cosmic setting. Hallucinatory and lucid in its delivery and appearance, Miró schematically reduces any form of realism or excess representation down to the primary instinctual and emotional aspects of the subject. Indeed Miró comments how ‘in 1925 I was drawing almost entirely from hallucinations’ and describes his working process to American Art Historian James J. Sweeney in 1948 as ‘free’ and ‘unconscious’ . Dada’s use of chance is used to underscore an emphasis on processes, uncontrollable forces and a realignment of ‘making’ art whereas Surrealism extends this to enter into a dialogue with the automatic and use its potential to create associative and equally evocative art forms. B. Smith, Modernism’s History: A Study in Twentieth-century Art and Ideas (UNSW Press, 1998), p. 135. M. Iverse, Chance: Documents of Contemporary Art (Whitechapel Art Gallery, 2010), Introduction. D. Weir, Anarchy and Culture (University of Massachusetts Press, 1997), p. 238. E. Robertson, Arp: Painter, Poet, Sculptor (Yale University Press, 2006), pp. 33-35. D. Jones, Dada Culture: Critical Texts on the Avant-garde (Rodopi, 2006), p. 244. S. Levy, Surrealism: Surrealist Visuality (Edinburgh University Press, 1997), p. 81.